With summer just weeks away, this photo of shoveling snow after a Maine blizzard in the mid-1960’s serves as a reminder of the joys of Spring. After a 12 inch snowfall, clearing the driveway to go to work was usually unnecessary. You just drove off. When the storm drops 3-6 feet of snow in 24 hours a different strategy is needed. 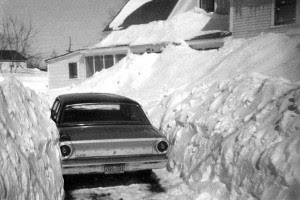 As shown in this photo of my home where I grew up in Derby, Maine, having snow drifts piled up against the porch to the roof meant digging a tunnel to use the main entrance. That, however, came later. First priority was (finding and) digging out the car parked in the yard. To begin, I grabbed a broom and shovel and made an exit out an upstairs bedroom window, and stepped off the porch roof. At this point no part of the car was showing in the blanket of snow. The broom was flipped as I used the handle to poke in the snow listening for a thump. Within a half hour of thump/no thump the holes formed an outline of the car, and it was time for the shovel. After two hours digging down just outside the outline of broomstick holes, the results show the car in a canyon of snow. A few years later Dad installed a sliding door in the back shed, purchased a snowblower, and then cranked her up before driving out the door after each storm. I don’t blame him. His labor force of 5 boys were grown and moved out by then.